This is our beautiful bird, Juju. We think she is about 5 years old. 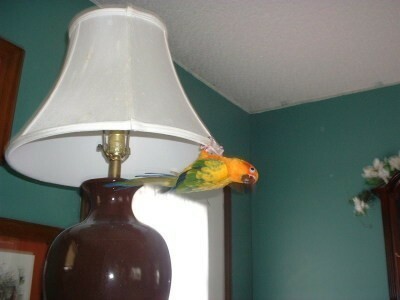 She is a Sun Conure. Conures come from South and Central America. We got her about 4 years ago as a rescue. Her former owners didn't realize how noisy and demanding conures can be. They also had no idea how to care for her. Her diet consisted of salted sunflower seeds, froot loops, and chex mix and she was never allowed out of her cage. She loves to chew things! Anything from her toys to your shirt if you are not paying attention. She also likes to burrow under your shirt or blanket and hide. She is a funny and loving pet to most of our family. Unfortunately, some experience in her former home has given her a dislike of young boys, so she is often aggressive to our son. Please learn about any animal you are thinking of getting to be sure they are a good fit for your home and family! Juju is beautiful and what a cute name. I agree with you about pets from previous owners. If there's a problem in behavior, it's best to know it before getting, but Juju is irresistible. She is rather charming, thanks! We deal with her issues but it would have been better for everyone if her former owners had taken the time to find out about the challenges of owning a bird. She is such a beautiful bird, and deserves to have a real home, that can care for her. What a beautiful little bird. We have many beautiful parrots that are native to where I live, Australia, but that breed is not one of them. You are right and asking people to find out the ins and outs of caring for pets before they get them. There was a really disturbing picture in the news recently of a cat that got hugely fat, because its owners fed it nothing except biscuits and candy. Fortunately it was rescued and taken to an animal shelter to be slimmed down and fed a proper cat diet. Wonderful advise! More people need to find out all they can about their pets. I love your bird. Perhaps you can work slowly with her to accept your son. Boys have a somewhat teasing nature and dogs, I know, pick up on that. Glad you found her. What wonderful advice and what a wonderful home Juju has now :-) If you don't already, I recommend reading Bird Talk magazine for great articles on bird behavior and other interesting things, too. I've got three rescue parrots myself and they have long memories if they've been mistreated previously, but with patience and love, which it sounds like your family has plenty of, they do come around. Juju could live for 20+ more years, so you've got time! I wish you all the best and it makes me so happy to see birds like Juju go to kind, thoughtful familes like yours. JuJu is so pretty and even has a pretty and fun name! With time I hope JuJu will accept your son. She is so pretty that pic of her in the sink was just adorable. How darling! 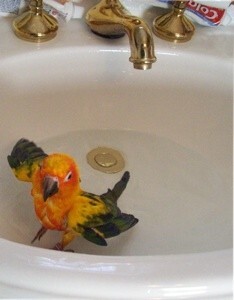 I never thought about allowing our parakeet to play in the sink; I've put a bowl of water in his cage. I can't wait to try this!